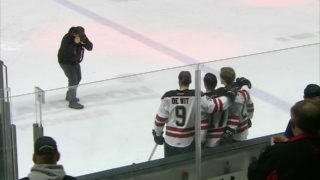 The Red Deer Rebels must be wondering what they’ve done to annoy the hockey gods. 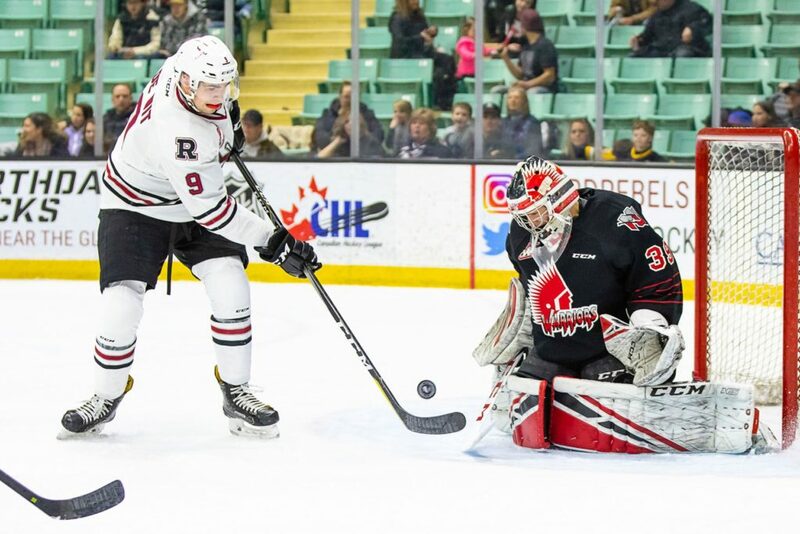 The Rebels carried the play from start to finish Saturday night at the Centrium, but a combination of strong goaltending from Moose Jaw Warriors stopper Adam Evanoff and an unbelievable lack of puck luck led to a fifth straight Western Hockey League loss. Evanoff turned aside 47 shots to backstop the visitors to an extremely fortunate 2-1 victory before 4,484 fans. 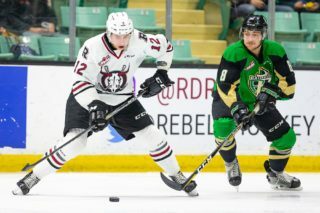 The Rebels didn’t score their lone goal until the final minute and combined with the 17 shots they directed at the Regina Pats’ net in the third period of Friday’s 3-2 overtime loss, that’s one tally on 65 shots through 80 minutes. “You can’t look at our effort and say it wasn’t great. 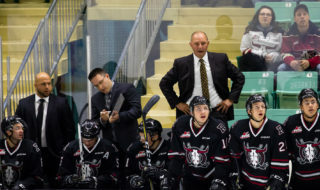 We had a really good effort here, we played hard,” said Rebels GM/head coach Brent Sutter. “We created a lot and did a lot of good things. You outshoot your opposition two to one or even more than that (48-21). The Rebels led 13-7 on the shot clock following a scoreless opening period and outshot their guests 17-7 in the second frame. But the Warriors took advantage of their opportunities to pot a pair of goals in the middle stanza while the Rebels couldn’t get a bounce and Evanoff stood tall. 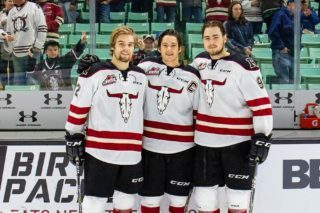 Brayden Tracy hauled in a stretch pass from Tristin Langan and beat Rebels goalie Ethan Anders through the five-hole on a breakaway at 13:03, and Langan picked the top corner from the low slot just under four minutes later. The third period was more of the same in terms of territorial play, with the Rebels firing 18 shots at Evanoff but failing to cash in until Brett Davis converted a pass from Alex Alexeyev, notching his 17th of the season with a low shot from the right circle. Brandon Hagel also drew a helper on the goal to become the Rebels all-time franchise leader in assists with 162, one more than former record holder Arron Asham. The Rebels stormed the Warriors end in the final seconds and tested Evanoff on a couple of occasions, but once again were snake-bitten. “You have to dig yourself out of a hole and tonight we battled,” said Sutter. “I told the kids after the game that I’ll never have an issue with them if they play that hard and compete that hard. Pucks will eventually go in the net. “We’re having a hard time scoring right now. We’ve scored six goals in the last five games. It makes it difficult to win games when you’re only getting that much offence. Another plus for the Rebels Saturday was the fact that they didn’t allow a man advantage goal. The Warriors have the second-ranked power play in the league but were zero-for-three. Red Deer was zero-for-four on the power play but did generate plenty of scoring chances. 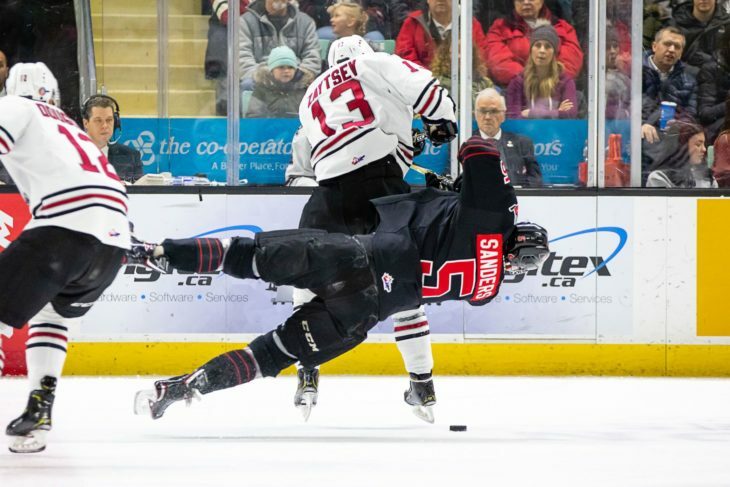 The Rebels open a five-game US Division trip Tuesday in Spokane and although the club would have preferred heading out with a win under their belts, Hagel agreed they can still take a measure of momentum with them following Saturday’s performance. “Obviously we’re in a little something right now but that was definitely a step out of it,” he said. “I think if we just keep continuing on pucks will go in the net. 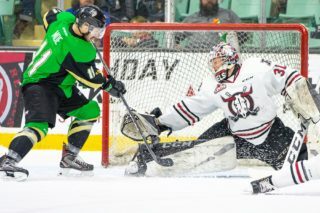 Notable: Anders recorded 19 saves, none more spectacular than a diving stop he made on Justin Almeida during a second-period Moose Jaw power play . . . Evanoff was the obvious choice as first star of the game, with Hagel and Langan following in order.